The Toshiba Canvio Ready 1TB External Hard Disk features a USB 3.0 connectivity, which can transfer your data at the rate of 5GB/s. The device comes with a shock sensor, which is able to cut the power to prevent the data loss during physical stress. Click here to buy. 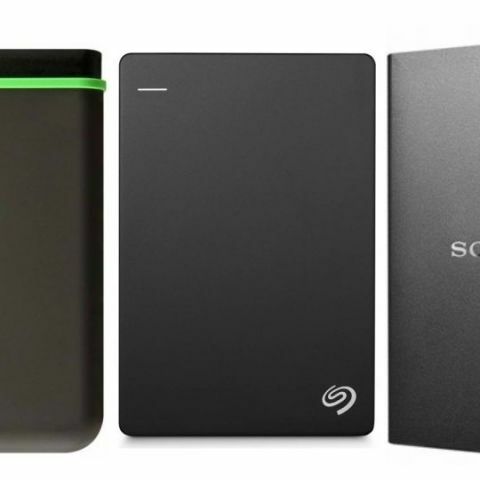 The Seagate Plus Slim 1TB External Hard Disk comes with a USB 3.0 interface and is compatible with USB 2.0 as well. Users can also backup photos and videos of their mobile to this hard disk via the Lyve app. Click here to buy. The Transcend StoreJet 1TB External Hard Disk is compatible Windows 7 and above as well as works with Mac OS. The hard drive features a USB 3.0 interface and can transfer the data at the rate of 5GB/s. Click here to buy. The WD Elements 1TB External Hard Disk is compatible with both Windows and Mac. The hard disk features a USB 3.0 interface, which can transfer the data at the rate of 5GB/s. It also supports USB 2.0 interface and transfers the data at the rate of 480MB/s. Click here to buy. The Sony 1TB External Hard Disk is compatible with Windows 7 and above. The hard disk transfers the data at the rate of 5GB/s via USB 3.0 interface, and 480MB/s via USB 2.0. Click here to buy.